More Than 700 Hot Air Balloons Are Launched Over Nine Days At The International Balloon Fiesta. Home » earth » new mexico » north america » usa » More Than 700 Hot Air Balloons Are Launched Over Nine Days At The International Balloon Fiesta. You've never seen hot air balloons like this before! 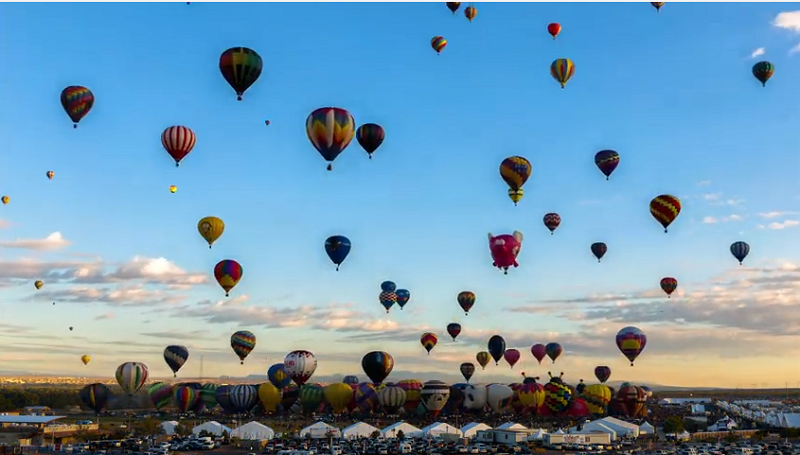 A couple of weeks ago, Albuquerque, New Mexico held its 42nd annual International Balloon Fiesta. It's a 9-day event where over 700 balloons see liftoff. It's the largest hot air balloon festival in the entire world and we were on hand to capture the action. Beep.. Beep.. Beep.. The Alarm goes off at 4 am. Time to get ready for a morning full of hot air balloons! Eat a quick breakfast (maybe), grab the batteries off the chargers, cameras and warm clothes and head out for the field! This was my favourite part of shooting the Balloon Fiesta. The early morning anticipation running around the field in the dark trying to find the row of balloons that will go off for dawn patrol! The Balloon's will be all laid out on the ground and just as you start to see some light back-lighting the Sandia's mountains the first group of balloons start to inflate. The best pilots go up before the sunrise to find out what the wind conditions will be like for the day. They take off one after another into the dark of the morning. After that, it gets crazy. Dawn Ascension is when all of the balloons (excluding dawn patrol) take off one after another starting just before the sunrise. There is so much to see and so many absolutely massive balloon's littering the field. Darth Vader's head fills and lifts above you. You watch it ascend into the glowing morning sky, surrounded by the hundreds of colors and shapes of balloons everywhere. In an impressively overwhelming way, 500+ balloons take off in the span of an hour and a half. When the field finally starts to empty, your heart starts to beat and you jump in your vehicle to chase after the still flying balloons. The balloons land anywhere they can in Albuquerque. From school yards, to back yards to the middle of the street, the whole community unites to pull the balloons from the sky and celebrate those rides of a lifetime. You can discover all the holiday packages of Nepal featured here on this portal. Our nepal tour packages present relaxed stay at Nepal hotels, visiting the attractions and fun-filled activities. Nepal is well known for its sincerity, deep religious studies and religious godliness.